So here we are at the furthest place I have ever travelled, and possibly ever will travel, from home. The furthest away from home but in a climate and landscape not too dissimilar to where I grew up. OK Leicester looks nothing like this but parts of the lake district aren't a million miles away (11722 miles to be exact...). 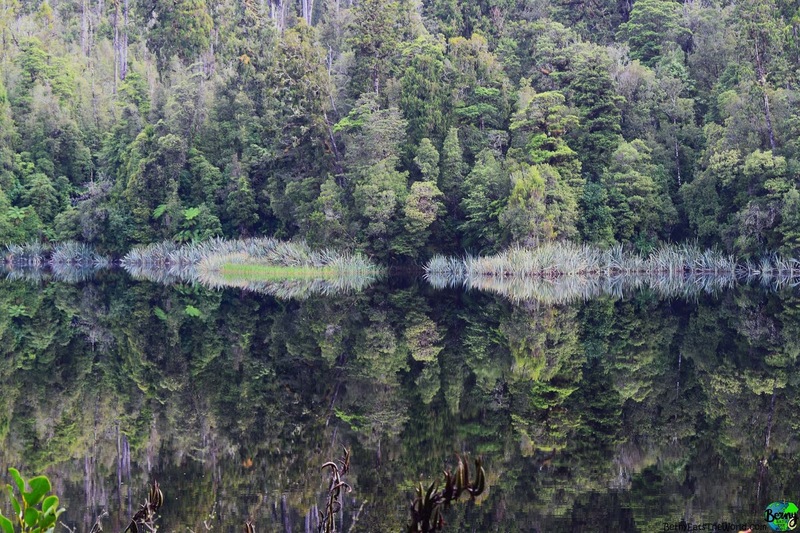 The difference being, every square inch of New Zealand is outstanding beauty where lush green rolling hills turn into snow capped mountains and eel filled mirror lakes become whale filled seas. The air is crisp and blue and felt like it cleared the the 5 year build up of Beijing pollution in my lungs in the first breath. 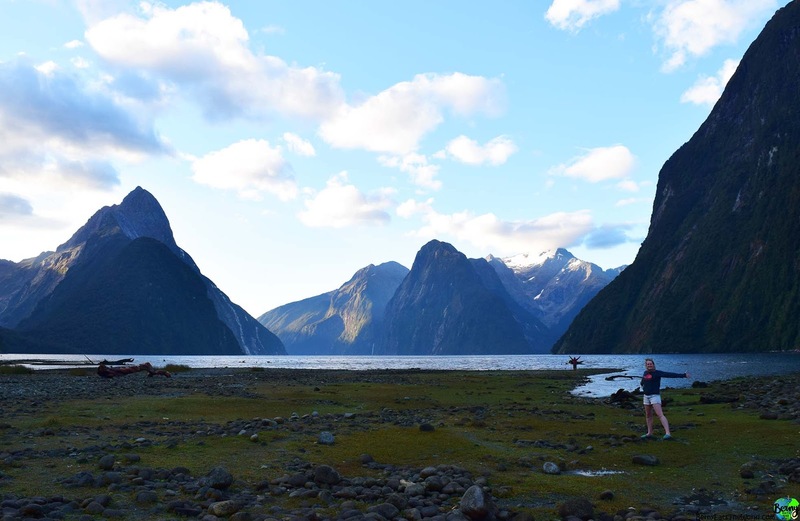 This is New Zealand and I think we have fallen in love with it. We woke up in Wellington with the plan to pick up our Jucy Camper van, get on the first ferry to the South Island and drive the 4 hours to Kaikoura before dark. Maybe even visit a few wineries on the way! This didn't completely go to plan... we got to the ferry port to find that the first departure was not at 11AM as we thought but actually at 1PM. No major concern. 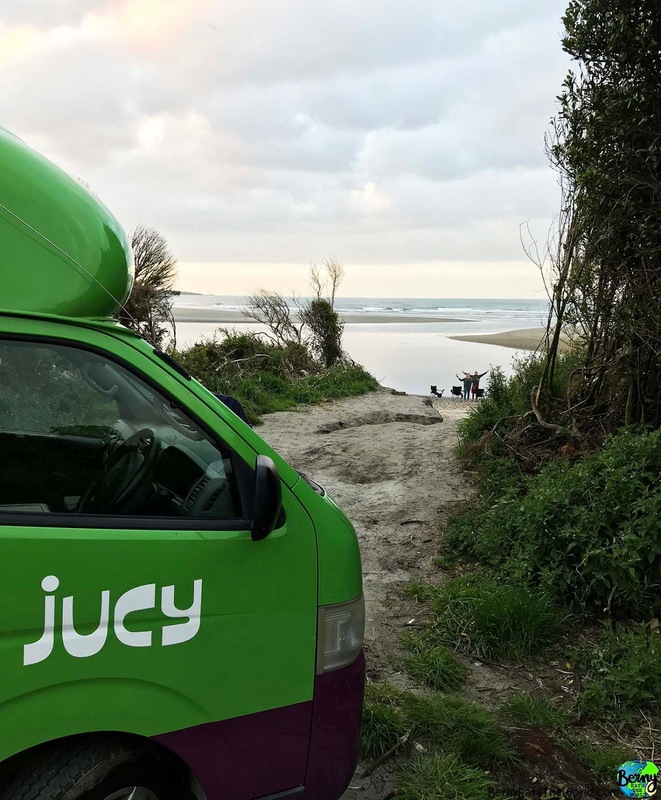 We ate lunch in town, drove back to Jucy to pick up the camper chairs we realised they forgot to pack for us and drove back in time for our 1PM ferry. However, somewhere lost in the communication between me and Jucy, we were never booked on to the already full 1PM ferry... After a phone call to Jucy we were booked on to the next ferry... at 8PM! 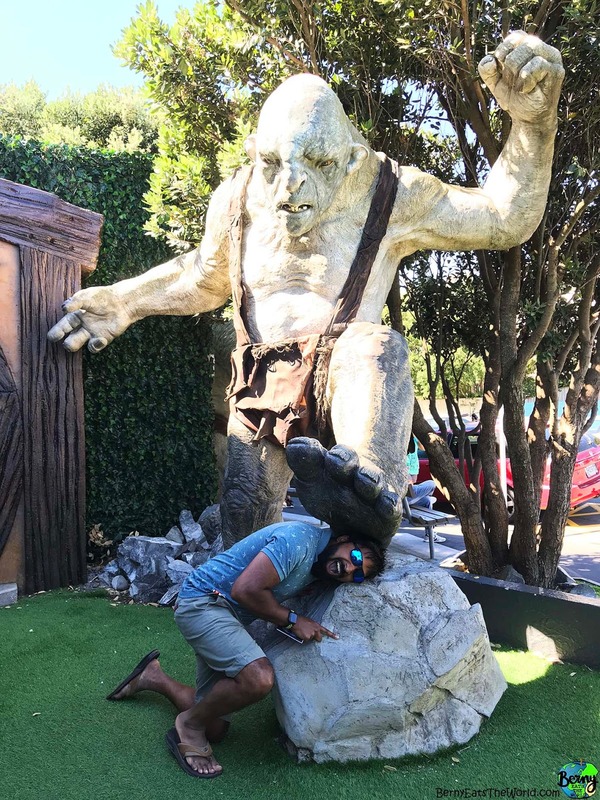 So much for our wine filled, leisurely drive to Kaikoura. Instead, 4 hour drive through the night and arriving at half 2 in the morning. Determined to not allow our first day in New Zealand to be a wasted day we filled it with Wellington activities. First stop was of course a late breakfast on the harbour side where I chowed down on a delicious bowl of Cloudy Bay Clam Chowder. Not quintessentially New Zealand...ic? ish? Kiwi? 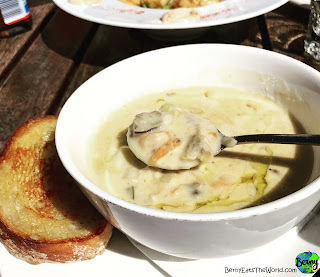 Clam Chowder is not necessarily a local delicacy but made with Cloudy Bay clams it can't be from anywhere else! The only clam chowder I had ever eaten before was tinned and my go to "posh" meal whilst I was at university. Sitting outside with the sun on my back, slurping a beautifully rich chowder let all the ferry stresses drift away. 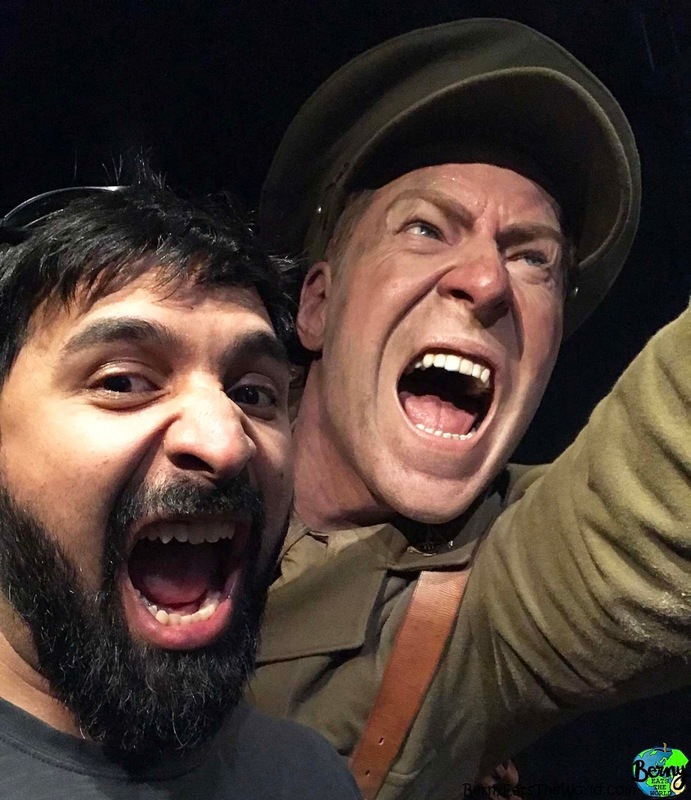 The current Gallipoli exhibition in the Te Papa Museum is like nothing you have ever seen and will ever see again. Created by Peter Jackson's Weta Studios, it boasts 24000 hours of work to create these hyper realistic giant replicas capturing ordinary New Zealanders at the heart of the Gallipoli war. It is mindbogglingly impressive. We drove up to the Wellington viewpoint and ate a cracking late lunch at Karaka Cafe where National Dish number one, the Hangi, was ticked off. Kind of. Researching the Hangi before the trip, I knew getting a traditional Hangi in New Zealand was going to be close to impossible. Put on for big celebrations it is hunks of meat buried underground with hot rocks and an array of vegetables. The most important vegetable being the Kumara - a type of sweet potato. I could live in New Zealand for a year and struggle to get my lips round a real Hangi. However the Karaka Cafe made their's, under the ground or in the oven, I am ticking it off anyway! It was smokey and succulent and could very well have been cooked in the ground. Even though I read their website and know for a fact that it wasn't... Ticked! The saddest part of not catching our intended ferry was that the stunning views from the ferry and scenic drive to Kaikoura was blanketed in the night sky. 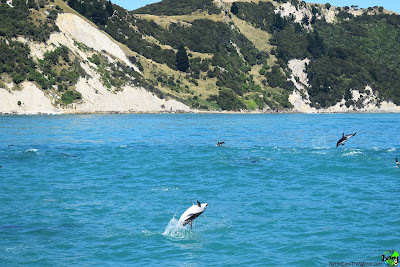 Our first day in Kaikoura was probably my most anticipated day of the trip as we had the "Dolphin Encounter" booked. This was the single most extraordinary wildlife experience I have ever had. Coming from somebody who has cage dived with Great Whites in South Africa; seen Orangutans in the rain forests of Borneo and watched lions eat an elephant in Zimbabwe - this was incredible. We took a boat out to sea and found a pod of well over 200 dolphins and jumped in, with snorkels on, right smack in the middle of them. These were completely wild Dolphins and they just wanted to play. Encouraged to make silly noises to attract them it was surprising how curious they were about you. 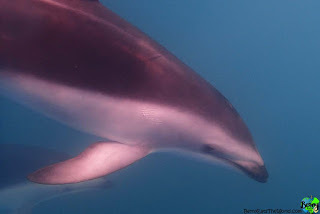 I sang high pitch versions of Super Mario Bros and Tetris through my snorkel and watched dolphins actively seek me out and hold eye contact as I swam. They would literally swim by as if you weren't there and then you sing and watch them turn back and swim with you. Then you run out of breath because, as it turns out, swimming and singing at the same time is hard work and they all leave. We had three separate swim sessions with them followed by a casual viewing from the boat deck where we learnt more about the pod. 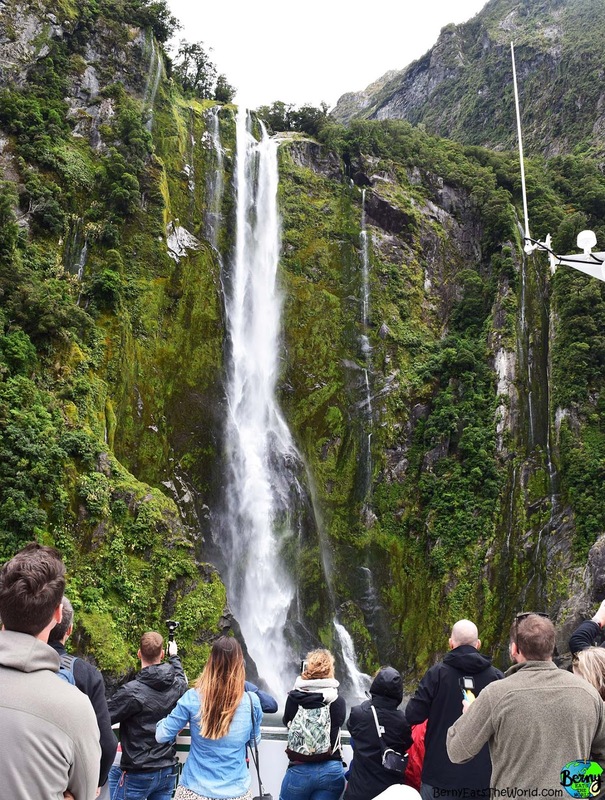 It was the most amazing experience and should be the number one thing on your list of things to do in New Zealand. I don't think there is anywhere else in the world like it. We still had most of the day to play in Kaikoura and so we drove up to the peninsula to see the sea lion colony. After a morning of swimming with dolphins, I knew that just looking at sea lions was not going to be the highlight of the trip. It was something to do! 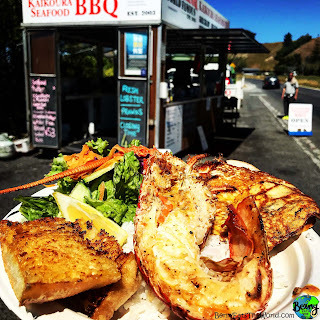 But, more importantly it had a well known street side lobster shack on the way! 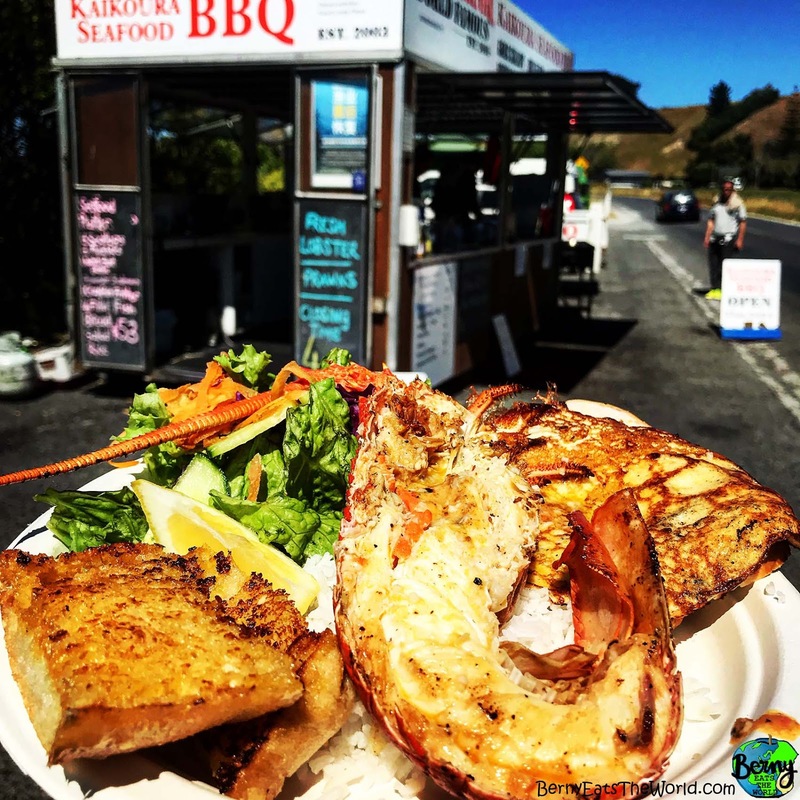 Come for the sea lions, stay for the lobster. Or as they call it here - Crayfish. I am not even a great fan of lobster so I don't know why I get so excited about it. 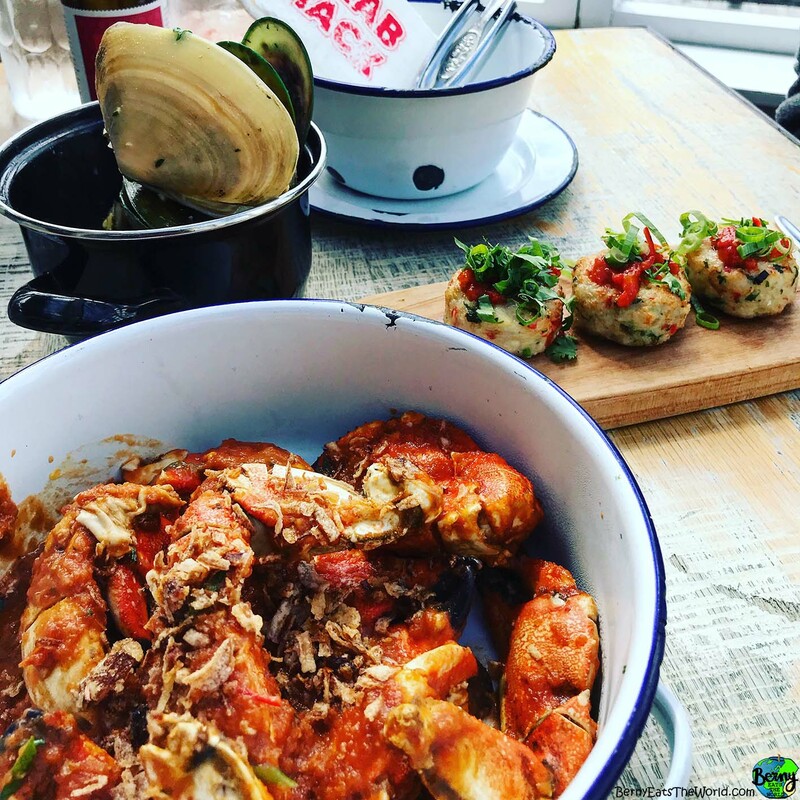 I much prefer a well prepared crab or an enormous prawn. It was a very tasty lobster but for that price I could get five times as much crab! I also got to tick off a New Zealand's own Whitebait Fritter which was also a tad disappointing. When I think fritter I think deep fried, crispy goodness. Fritter here actually means anything fried in egg - or an omelette as the rest of the world know it. It was a satisfying meal all in all but nothing I'd be rushing back for. We started our drive to Arthur's Pass the next morning via a few Wineries in Waipara to pick up a couple of bottles for our evenings camping. These wineries are all stunningly beautiful and we couldn't resist an early lunch at "Black Estate" where we shared the most succulent joint of barbecued lamb I had ever eaten. With bottles of wine in hand we journeyed on through the rolling hills and mountainous landscapes of Arthur's Pass. We parked up our van in Klondyke Corner where we paid 8NZD each into an honesty box and enjoyed our first wild camping experience. 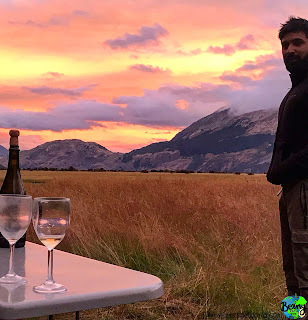 We cooked a bacon and mushroom risotto out the back of our van and sat at a makeshift table sipping award winning wine from plastic wine glasses whilst the sun sank behind the mountains. A 5 minute drive in the morning took us to clean toilets and a cafe to eat breakfast. 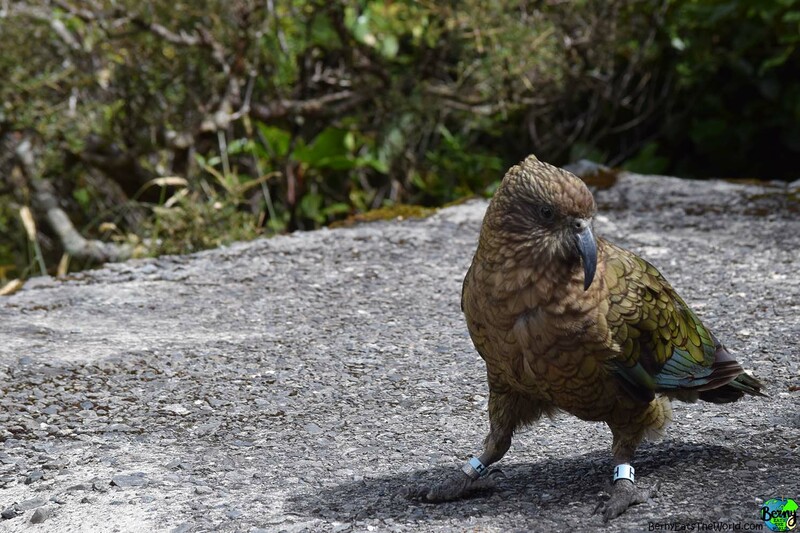 This is a popular stop off for road trippers and the rare local bird, the Kea, have learnt that this is the best spot to get a meal. Signs are all over the place warning of the Kea as they like to destroy things for no other reason than simply just for fun. I watched as one pulled rubber caps off the front of a car and throw them on the floor whilst another pierced holes in the back. I probably should have stopped them from destroying somebodies car but instead I just stood and took photos. 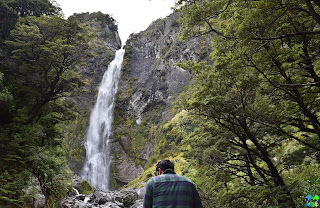 A little bit of hiking around the cafe to some waterfalls was a nice activity before leaving Arthur's Pass for Fox Glacier. 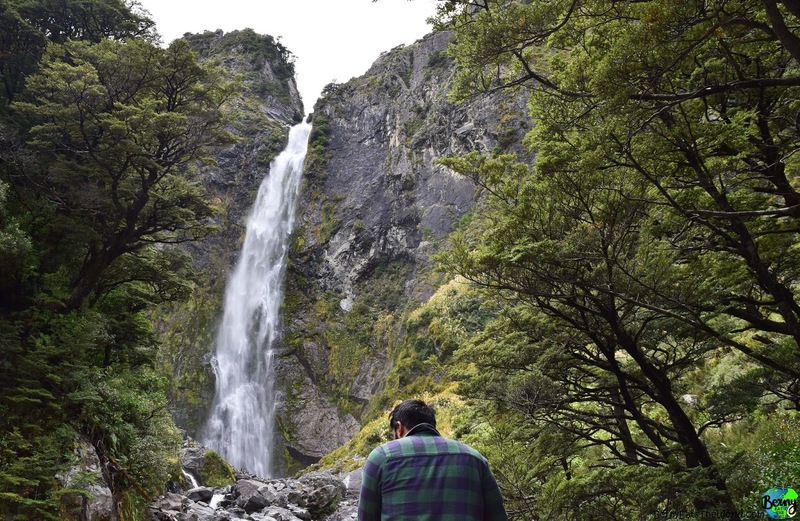 There is so much to do between Arthur's Pass and Fox Glacier! The drive would take 3.5 hours if you didn't stop but that would be silly. We spent the whole day getting there but our stop offs were brilliant! 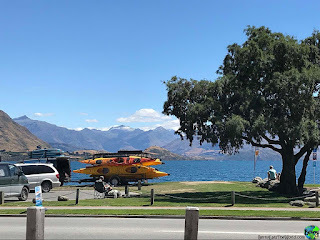 We ate lunch by the beach at Hokatika before driving to the milky blue gorge for a swim. We took towels and trunks and felt very excited to jump in when we saw the water. 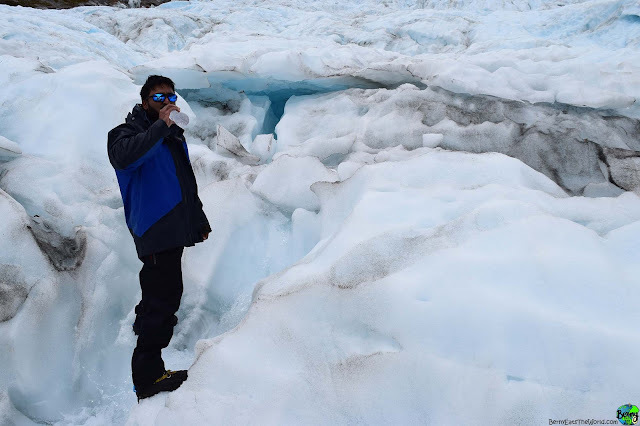 Then we got close enough to put a hand in and learnt very quickly that this water comes directly from the glacier that we are heading to. 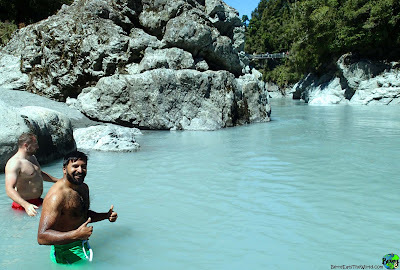 It was FREEZING but utterly refreshing - an instant mood booster. Another car stop at a lake was a nice leg stretch opportunity before arriving at Fox Glacier. AA Campervan site had everything you need as a camper and gave us a chance to recharge the van's batteries and cook on their provided gas barbecues. We bought steaks and an all in one fajita kit and had a barbecue night with a bottle of wine. We had a drink at the Bigfoot Bar and Restaurant before finishing our day on a sweet little glow worm trail just a few minutes walk around the corner. 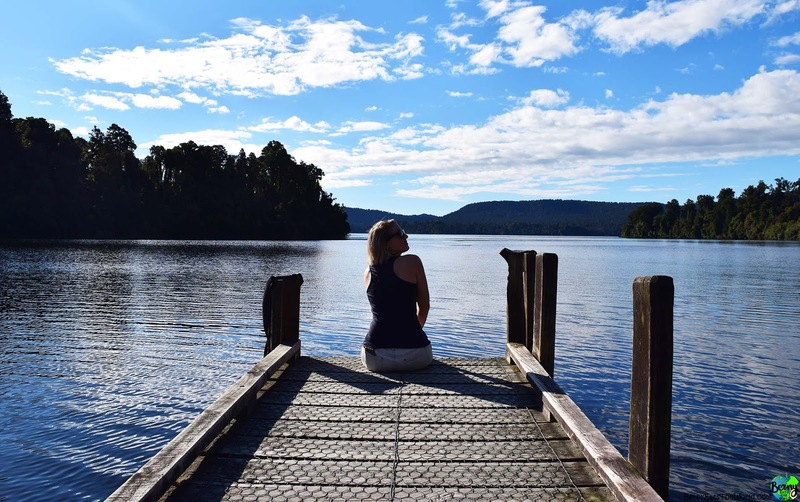 We woke up early to see Lake Matheson - the most photographed lake in New Zealand. 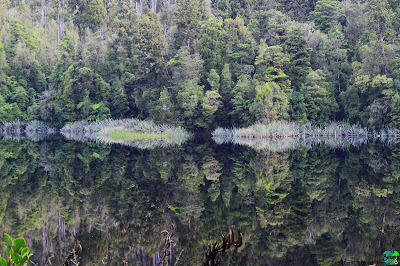 A beautiful morning hike took us around the entire lake with superb views of its famous mirror effect. My first ever helicopter ride was today as part of the Fox Glacier Heli Hike which had come recommended by a number of friends. It was a half days hike where apparently 50% get cancelled due to poor weather conditions. What made it more exciting was being informed about the possibility of being stranded on the glacier overnight if bad weather suddenly appears and helicopters can't pick us up. 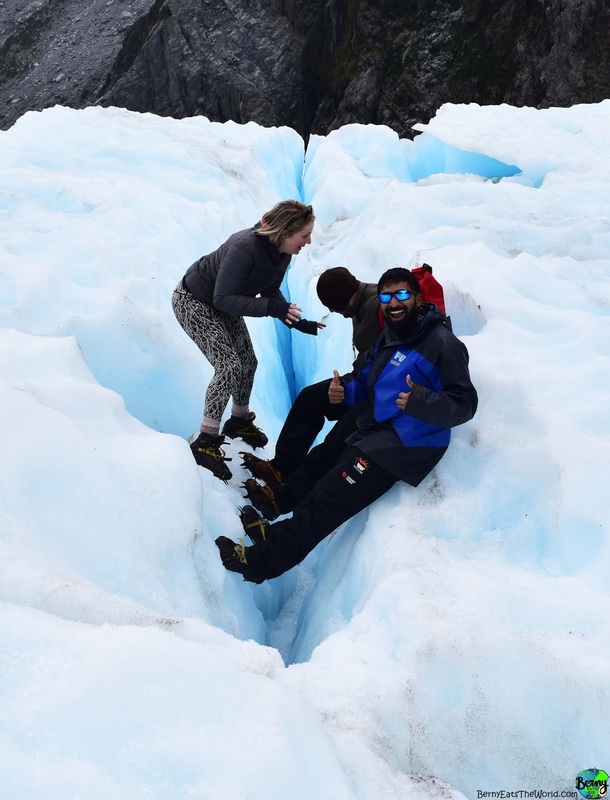 How many people can say that they have spent the night on a glacier before?! I have done a glacier hike once already in Iceland and really if you have been on one glacier then there's not going to be any major changes on the next one. The helicopter ride made it for me and sadly we did not get stranded. I am surprised that New Zealand Green Lipped Mussels are not listed as a National Dish here. No where else in the world do they grow so big and meaty and I leapt at the chance of devouring a mountain of these before leaving Fox. 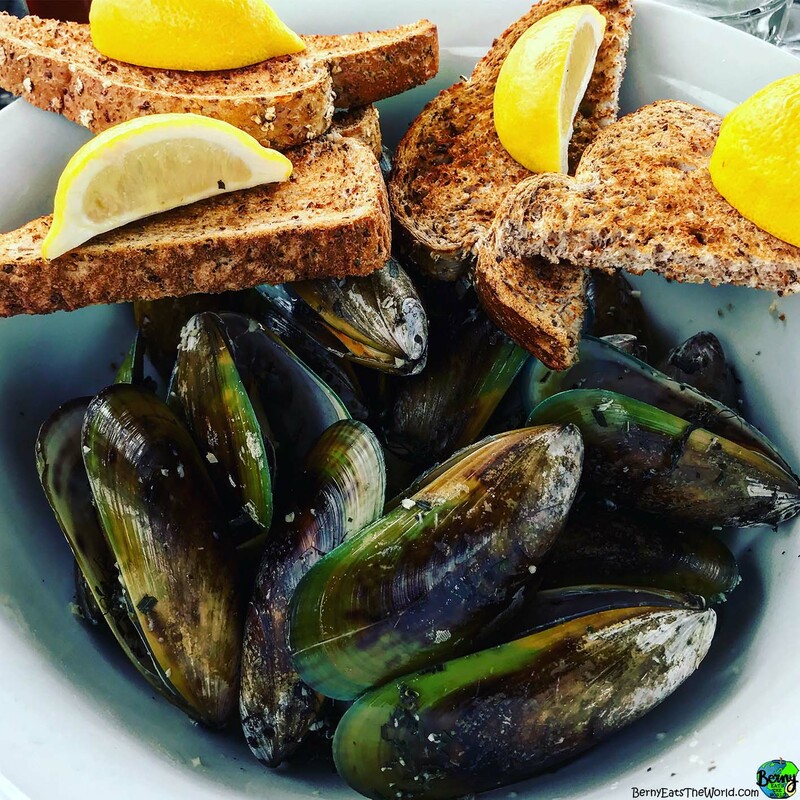 These giant, juicy mussels were sweet and delicious bathing in a garlic and white wine sauce. Crusty bread mopped up every last flavourful drop. 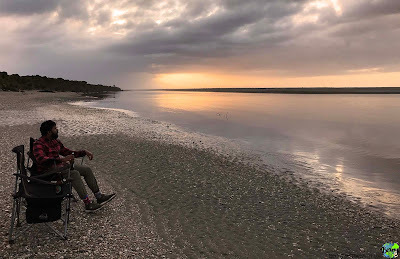 We were booked to stay two nights at AA Campervan Site but after our night in Klondyke Corner we knew that free camping was where the real beauty was. We found an amazing spot overlooking a deserted beach and set up camp for the night. It was perfect to sit and drink a few beers and play some beach games whilst the sun set. Sand fly have been prevalent throughout the trip but it was here where we really got to know one another. locked in our van for the night I spent a good half an hour killing all those that got in. This, you will be glad to know, is easy! They don't move fast and they like to gather on the lights so one swat of a light takes out like 10. Surprisingly satisfying. Then the morning came and the view outside was like the fly version of Hitchcock's The Birds. Our mini sunroof was open but with the netting and you could see a thousand swarming over it as if they just knew that fresh blood was inside. And when I say a thousand, I mean a billion. We would have just driven off had we not stored our beach chairs under the van! With a countdown we thought we would open the doors, grab the chairs, close the doors and drive off. 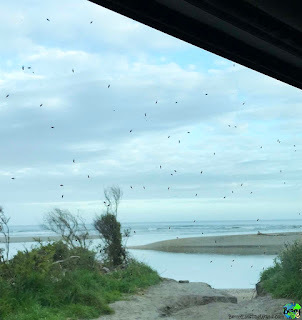 What actually happened was the second we opened the door, every single sand fly in New Zealand swarmed in as we all jumped out, left the car open and ran down the beach. Solution? We covered ourselves in DEET, got back in the car, held our breath in fear of inhaling fly and drove to the nearest car park with all windows and doors wide open. By the time we got to the car park the majority of flies had been blown out and we managed to keep hold of the majority of our blood. We unpacked the entire van into the carpark and repacked fly free. So much for our planned morning swim in the sea! 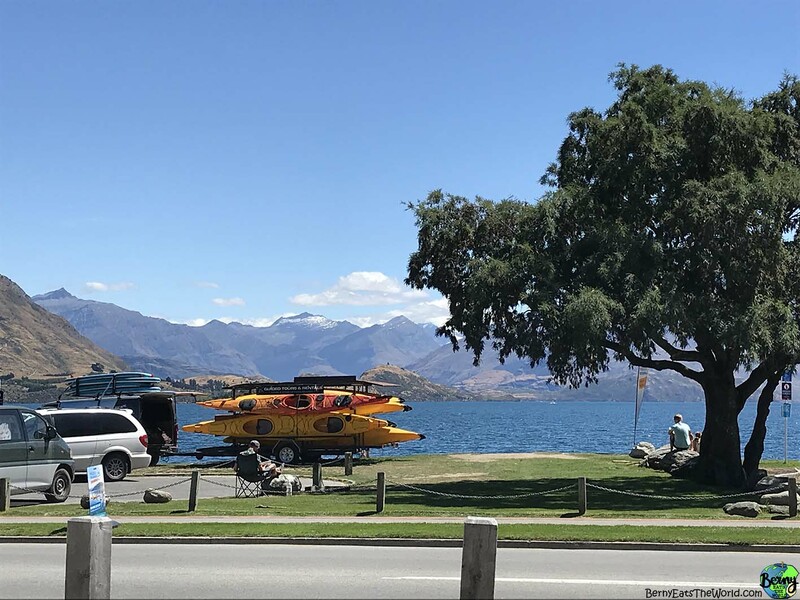 We got out of there pretty quickly and made our way to the stunning Lake Wanaka for a stop off before arriving at Queenstown. The drive on its own is worth it with lake views from the mountains followed by mountain views from the lakes! 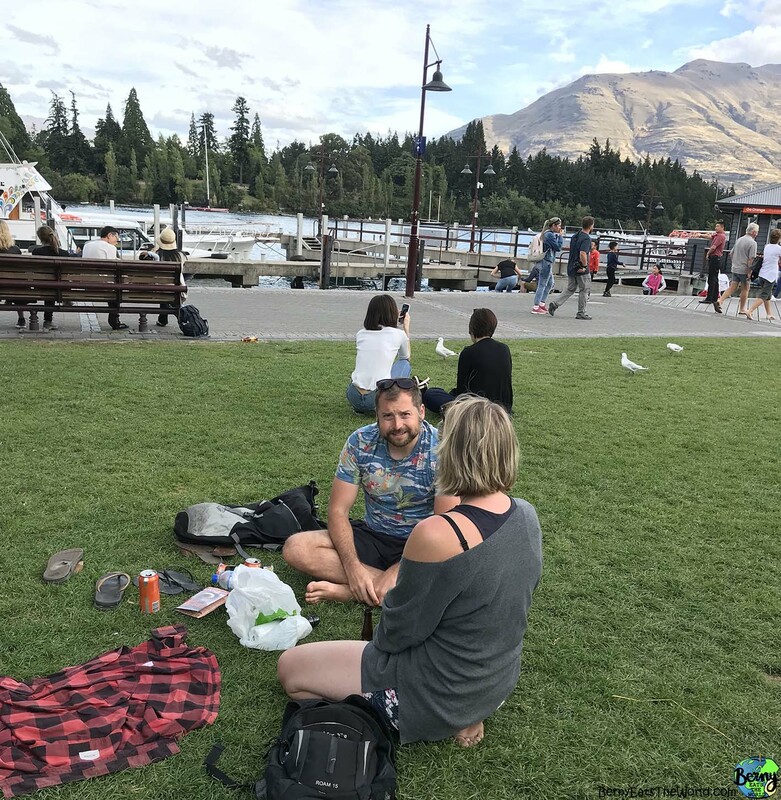 We parked up, itched our bites, and took a stroll along the water front imagining how much fitter we all would be if we grew up here. The water was sparkling under the hot sun and groups of kids and adults were taking part in a number of water activities from paddle boarding to windsurfing. It would be so hard to live a sedentary life here and everyone looks fit, happy and healthy. 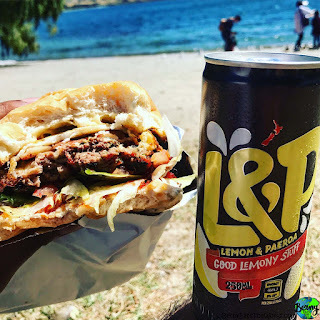 For lunch I ate a Kiwi Burger and washed it down with a Lemon and Paeroa drink; both local icons. The Kiwi burger is made from neither Kiwi bird meat or Kiwi fruit. Instead, for some reason, what makes it a Kiwi burger is the addition of beetroot and a fried egg. And the plural for Kiwi burger... is Kiwi burgers. 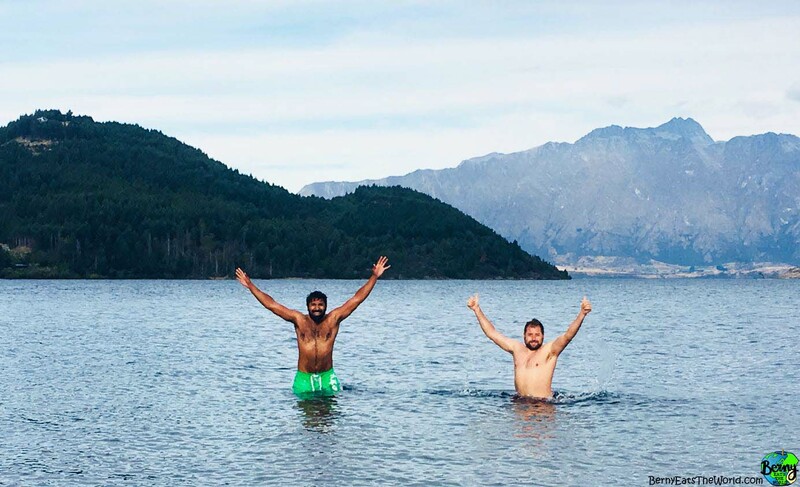 Before long we were in Queenstown marvelling at a different lake and still pondering how awesome life would have been if we grew up here. 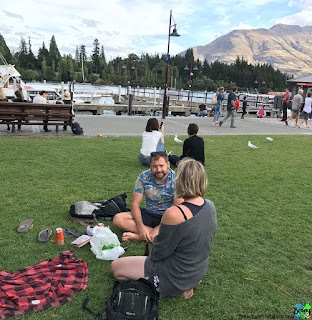 For me, Queenstown has the perfect urban to rural ratio with Lake Wakatipu at its heart. After a brief wonder around the city centre we drove to our camp site and claimed a peaceful spot with views of the lake. 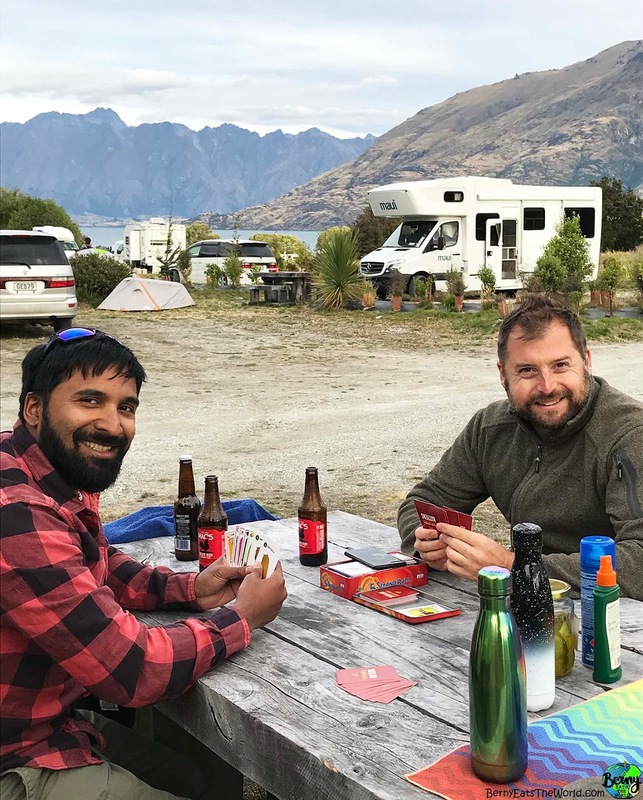 With a quick swim followed by some beers and a few games of Exploding Kittens we had a perfect restful evening - largely without the damn sand fly. Our first full day in Queenstown was a bit of a shambles as over a month ago we decided to go Sky Diving instead of doing the canyon swing; both famous activities here. When booking I remember very specifically thinking "why would I choose to go at 6AM when I could have a lie in and go at 11AM!?". 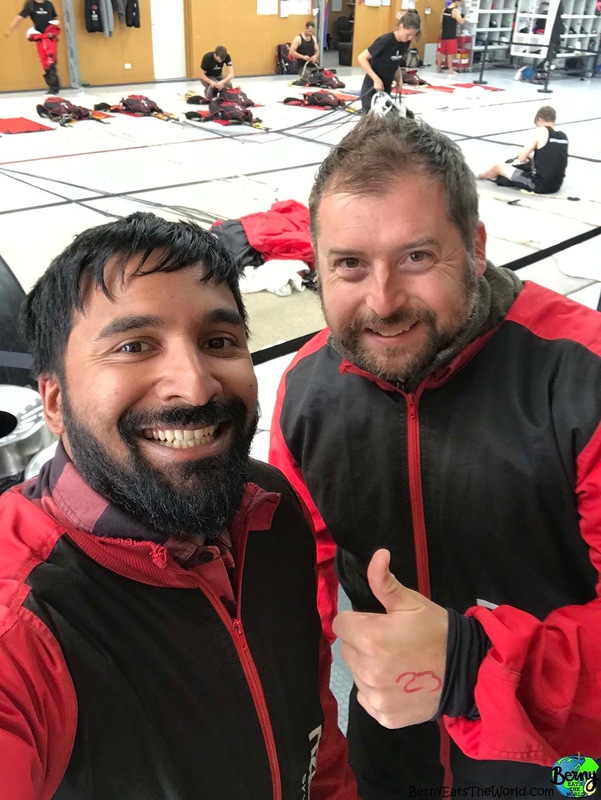 Turns out going early is very important when it comes to sky diving as wind speed is at its lowest. We got there, we did all the safety talks and we even had the suits on! We were in line getting ready to board the next plane when we were told that the winds had picked up and it was no longer safe. Absolutely gutted! 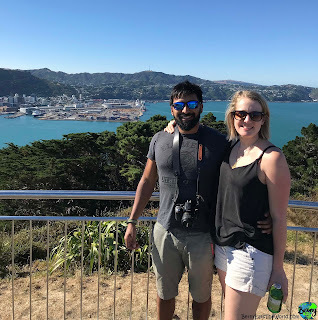 The most annoying part was that we had wasted the best part of the day when we could have been doing 100 other things in this beautiful city. Full sadness. To make up for it we spent our refund on the Shotover Whitewater Rafting with Go Orange for the following morning. We spent what was left of the day sat on the grass and enjoyed the sun. The rafting was great fun with grades 3-5 rapids it felt like the right amount of exciting danger. It was slightly annoying that I was not allowed to take my camera with me as I now have no way of showing you how great it was! 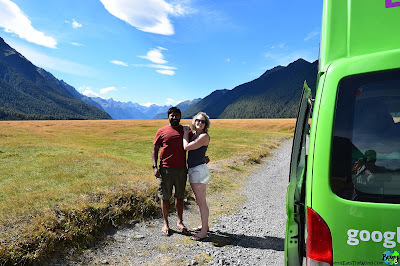 As soon as we got back from the rafting we did some quick shopping and got on the road towards The Milford Sounds. We had booked a spot for our van at Milford Sound Lodge but had we known about the beautiful free camping sites just outside Milford Sound we definitely would have gone for that. The drive down there was four and a half hours of stunning scenery. 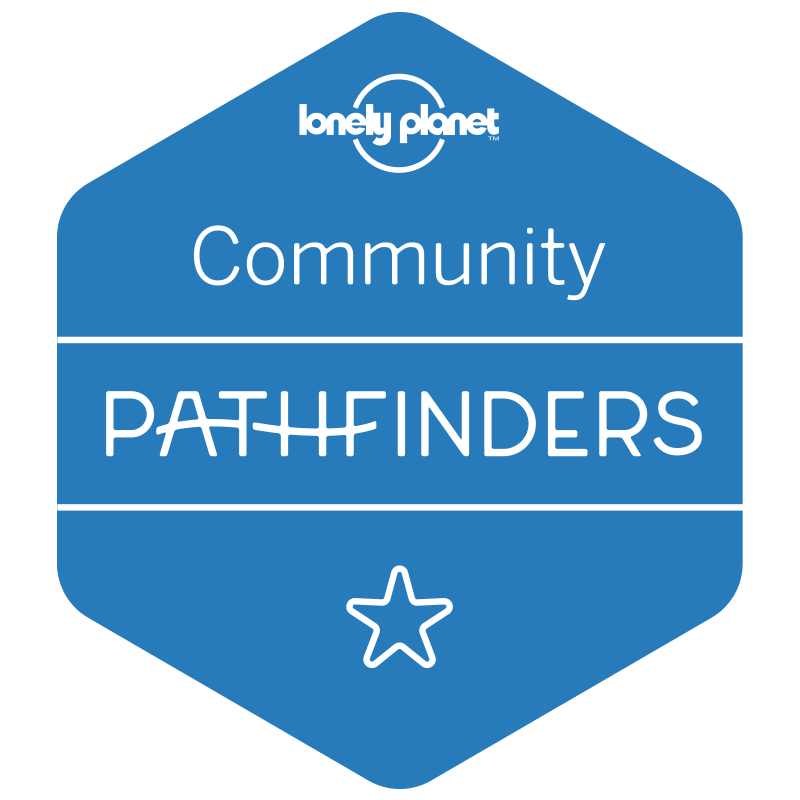 We could certainly have done it quicker but the desire to stop and get out to take in the surroundings was too much. We got to a point where we had to restrain ourselves if we wanted to arrive in day light and have enough time to cook! A short walk from the lodge took us to the famous spot just in time for the sunset. It is an incredibly dramatic scene and our boat trip the following day did not really add anything to it. 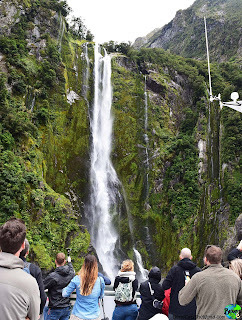 The view is impressive from this perfect distance and so getting right up close to the waterfalls and rock was not really necessary. But then if you did not do a boat trip then there really isn't much left to do. I know that partly I have been spoilt as a clear highlight of the boat trip was seeing the Sea Lions but my last holiday involved swimming with Sea Lions so I struggled a little to get excited about them. We agreed that, though it is very pretty, we may have had preferred some extra time somewhere else as it was quite the detour to get down here. On this occasion, it was the journey that was better than the destination. 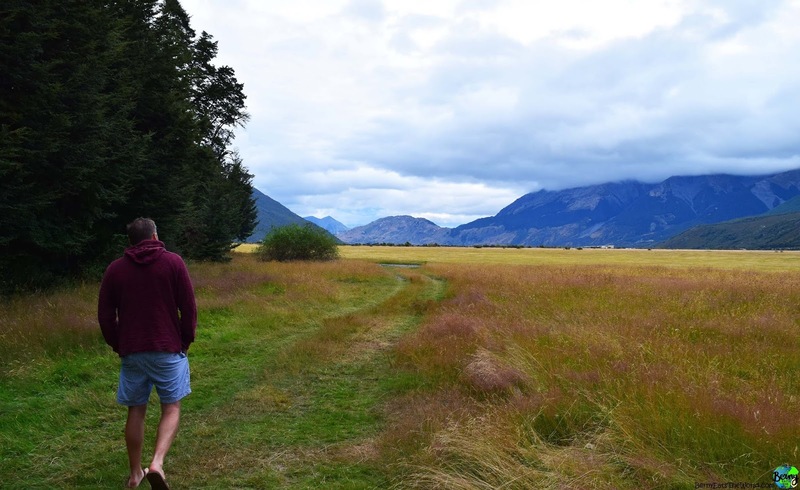 Our final night on the South Island was in a lovely hotel on the outskirts of Queenstown. A bit of pamper after 10 days camping was a real treat. Swimming pool, sauna, steam room and an actual full sized bed! 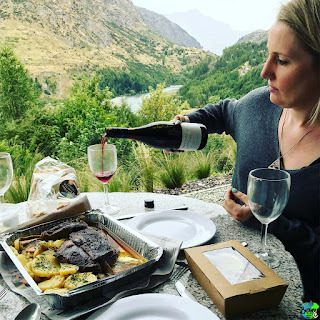 Just a few minutes drive from our hotel was a take-away restaurant that had three dishes: Roast potatoes, Coleslaw and 4 hour slow roasted lamb shoulder... 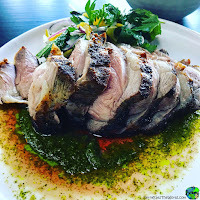 I don't know anywhere else in the world that does take away roast lamb but we had to try it. We picked it up and devoured it on our balcony with the last bottle of wine from the Black Estate wineries bought what feels like a lifetime ago. 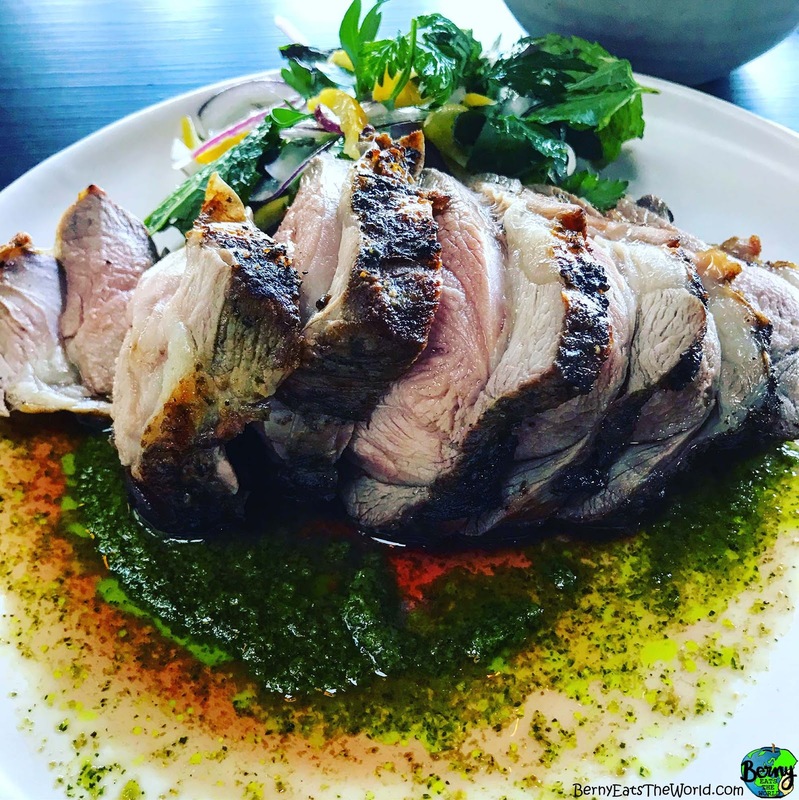 The bone slid out of the meat with ease leaving behind the softest, juiciest cut of lamb you will ever have the pleasure of eating. Though leaving our camper van behind felt like the end of our trip, flying back to Wellington and picking up our rental car felt like starting a whole new one! 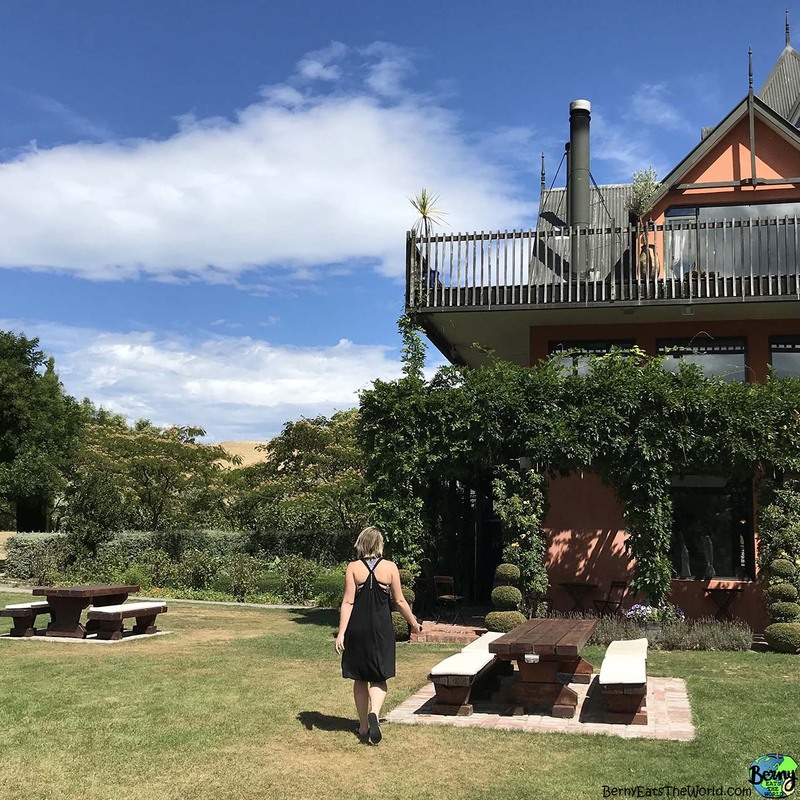 To finish our time in New Zealand we decided to spend some time in Martinborough wine region which was just a couple of hours drive north east from Wellington. 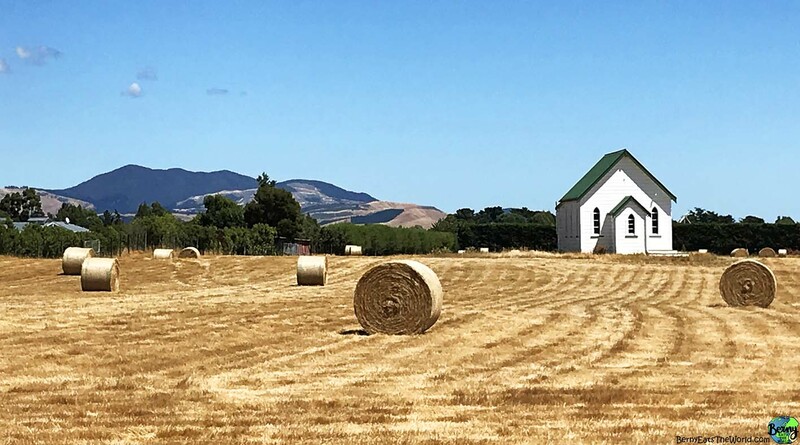 Martinborough is the lesser known wine region compared to the famous Marlborough and is known to be where New Zealanders go to drink wine rather than where tourists go. Our AirBnB was awesome and stepped directly out onto a field of grape vines. 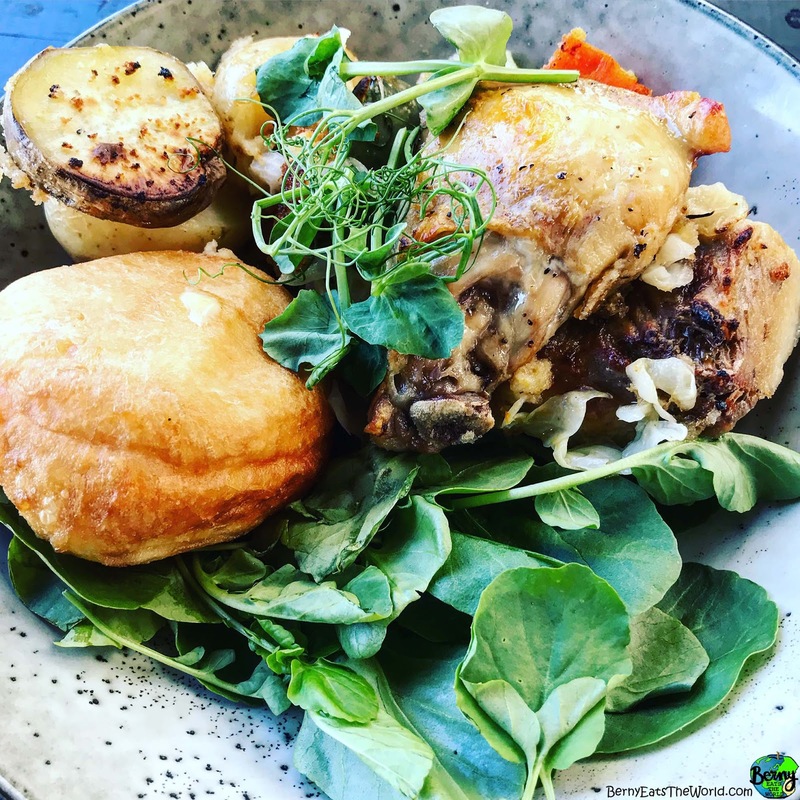 A short walk took us to a gently bustling town centre with a hum of people relaxing and chatting over a cold glass of locally grown white wine. A few bars, a few restaurants, all pleasantly full but not overcrowded. It was warm enough to sit outside and so we shared some tapas and drank a few glasses of wine under the stars at a bar called Cool Change. 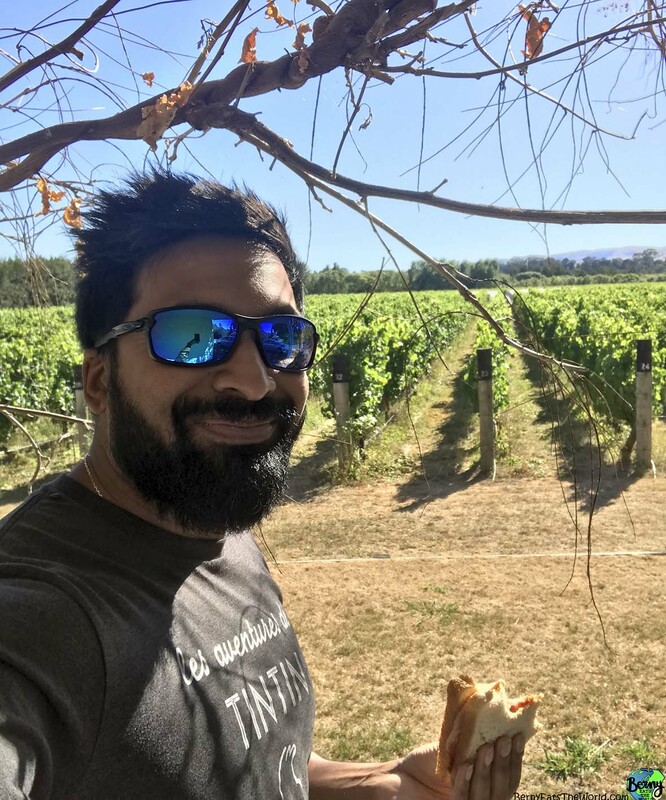 We contemplated many forms of transport around the wine regions with my favourite option being the four person bicycle cart but we ended up deciding to just walk it all. In hindsight, considering the amount of wine tasted, this was probably for the best. The day started like all great days; picking up bacon sandwiches from a local cafe. We booked a 10AM tasting at Ata Rangi where we had 6 taster wines each and given a nice talk on the history of the area. This was one of the few wineries that required booking and so for the rest we just turned up and decided to enter based on whether we liked the sound of their name or the look of their building. With 4 wines at Vynfields followed by 7 more at Poppies it was definitely time to eat. Poppies was certainly our favourite as Poppy herself explained her wines with full on passion and did serve deliciously crisp wines. We ate the most exquisite platter of local produce sloshed down with a bottle of her Rosé. 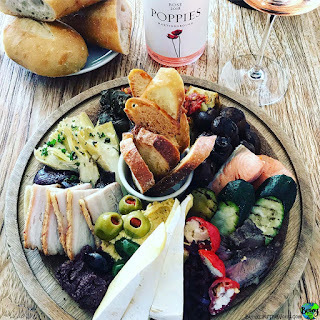 Hot smoked salmon, wedges of local Brie, Martinborough grown Olives, crispy pork belly, just everything on the plate was perfect with the Rosé. 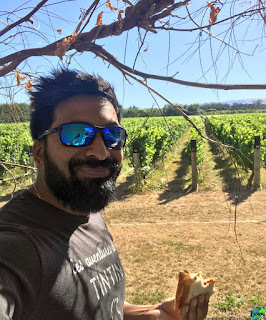 With stomachs re-lined we walked up to Te Kairanga winery and had our final 5 wine tastings before stumbling back to our AirBnB. To finish a full days worth of wineries of course we had to enjoy a full 5 course meal with wine pairings at a popular restaurant called Pinocchio. Followed by a night cap of a sweet dessert wine back at the Cool Change bar. 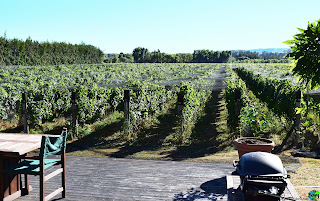 So total number of wines tasted in one day in Martinborough was 28! 6 more than my previous record in Stellenbosch!